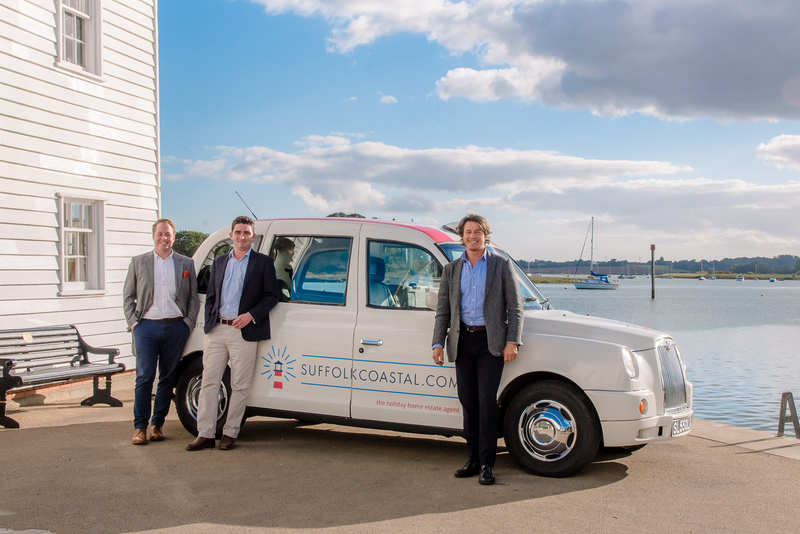 Suffolk’s newest estate agency Suffolk Coastal has come up with a novel way of transporting house-hunters around its properties on the market. The company has purchased a traditional London Taxi, now painted white and branded with the firm’s logo and the registration plate SL55OLK, which it uses to collect viewers from nearby railway stations. It is then driven to the homes they wish to view, and back to the station again afterwards. Managing Director Tim Day said: “Here at Suffolk Coastal, we want to go the extra mile for our buyers and sellers. Many of our prospective purchasers come from the capital - most of them arriving via Manningtree Railway Station, which is just 55 minutes from London’s Liverpool Street. Owning a former London taxi means that we can pick them up, show them around properties of interest and then return them the station once they have completed their viewings. The taxi – capable of taking five passengers at a time - is a traditional 2005 London cab, which is driven by MD Tim Day at weekends, and by his Head of Sales Harry Wass during the week. Suffolk born and bred, Harry has a degree in Real Estate Management, 12 years’ property experience behind him in London, and is the third generation in his family to establish a career in property in the county. Managing Director Tim Day is an estate agent with over 20 years' experience of selling, letting and holiday-letting residential property across prime central London. Now living on the Suffolk coast, his London property connections enable him to sell coastal homes in the county to buyers from the capital. He added: “As a pro-active local estate agent, we recognise that we have to go out of our way to do more for our clients during what is unquestionably a challenging market. 1) For more information please contact Suffolk Coastal Head of Sales Harry Wass on 01728 677980 or 07889 766364. 2) A hi-res jpeg of Suffolk Coastal MD Tim Day (right) with his traditional 2005 London taxi, now sign-written with the company logo is attached. He is joined by Head of Sales Harry Wass (left) and holiday letting specialist Harry Embleton (centre). 3) Suffolk Coastal is a new, independent estate agency based in Orford, specialising in selling properties along the Suffolk coast. The company takes phone calls and conducts accompanied viewings 7 days a week and has an in-house professional photographer. There is a pick-up and drop-off service for buyers arriving by train in the agency’s former London cab. The company also has a holiday let division (Air Manage Suffolk) as well as a sister agency in London – Cutler & Bond – based in Kensington. For more details, go to http://www.suffolkcoastal.com. This press release was distributed by ResponseSource Press Release Wire on behalf of Suffolk Coastal Estate Agents in the following categories: Home & Garden, Construction & Property, for more information visit https://pressreleasewire.responsesource.com/about.